– by Wendy Suzuki, PhD. 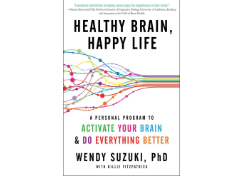 I had the pleasure of hearing Dr. Suzuki speak at a conference and was so intrigued with the neuroscience of the brain that I flew through her book. Dr. Suzuki explains in layperson terms the complexity of the brain, how the brain functions, and our ability to expand the size of our brains for greater thinking capacity, creativity and positive thinking. “Your brain is constantly responding to the way you interact with the world. The more diverse and complicated your interactions the more neural connections your brain will make (page 19).” Throughout our lives, we have the ability to “activate” our brains and Dr. Suzuki offers practical tips and techniques to accomplish this. A joyful read!